ZZ572/720R Deluxe - The Ultimate Beast! When our GM Performance Parts engineers sat down and designed the ZZ572/720R, we told them to build something nasty. We think they accomplished that mission with a resounding 720 horsepower and 685 lb.-ft. of torque—creating at the same time the most powerful big-block crate engine ever offered by GM Performance Parts. 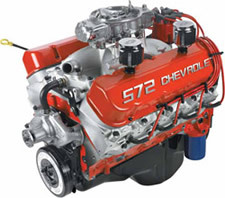 We took the ultra-popular ZZ572/620 pump gas street engine added 12:1 compression pistons, a hotter camshaft, and our rectangular-port aluminum Bowtie heads with stiffer valve springs to work with the new cam. The block is the Gen VI tall-deck Bowtie block which was designed for the 572" application. The solid roller camshaft is a .714" lift magic maker that aggressively feeds the air/fuel mixture into the hungry, high-squeeze, stroker big-block. The ZZ572/720R is rated at 720 horsepower at 6250 rpm and 685 lb.-ft. of gut-wrenching torque at 4500 rpm. The short block is built with a 4340 forged steel crankshaft, shot-peened forged steel rods, forged aluminum pistons with full-floating wrist pins, stiff dual valve springs, and a louvered oiling windage tray. Our Deluxe ZZ572/720R ships with a 1090-cfm Demon four-barrel carburetor, tall-deck single-plane water intake manifold, HEI distributor, aluminum short-style water pump, and 8 mm spark plug wires. 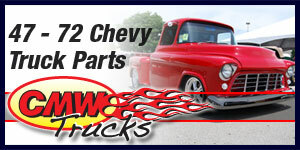 Distinctive “572” cast aluminum valve covers complete the package. All you need is a GM Performance Parts lightweight starter to fire it up! Clutch linkage boss is cast and machined in block, but must be drilled and tapped. When using cast iron exhaust manifolds, lower head bolts may need to be replaced with bolts with shorter heads, for clearance. Requires addition of starter and fuel pump (not included). Requires internally balanced flywheel for manual transmission applications. Big, sticky slicks will help hook up this monster!